Description: This military train headed north just to be stopped at CP10 for one more southbound. Description: Proof that track can be straight but NOT level! Description: CSXT 5110 leads a coal train across Love Street. Description: An eastbound intermodal train (probably Q174) rounds the curve at QB 101 to start the day. Description: CSX 5110 leads the train over Bridge Street. CSX 352 trails. Description: CSX 5110 passes by Parkton NC depot heading North to Raocky Mount NC. Description: matched AC44's on a RF&P manifest...after all the ES44's this was a surprise to me. Description: Q-108-06 rounds a curve just east of Anderson on the CSX Indianapolis Line. 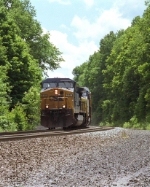 Description: Q-108-06 heads eastbound on the CSX Indianapolis Line near MP 244. Description: Q283 speeds down the west slope of Washington Hill at 1:07, passing the Old Dalton Rd. undergrade with CSX 5110 and 35 leading. Description: CSX 5110 leads a northbound intermodal past the Fallston Flagstop B&B. Description: Eastbound over the hump at 58th Street rumbles CSX general freight Q406. Description: Westbound off the MORL at CP King. Description: Hollow Road, 1625 hours. 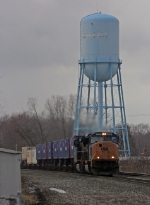 Description: CSX Q140 tears through Conneaut at trackspeed of 70 MPH.